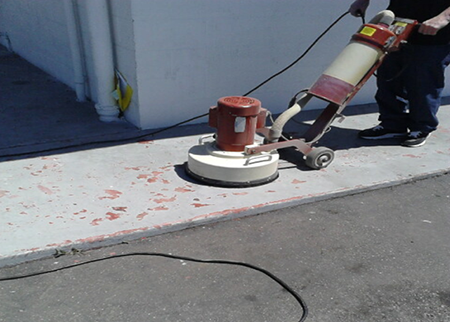 Stripe-A-Lot provides a variety of preparation methods for cleaning paint off your old floor, including shot blasting and diamond grinding. Cleaning dirt, rubber, sealers, paint, epoxies and adhesives to prepare your concrete floor for applying new lines, toppings and/or resealing is critical to the success of your project. To ensure longevity of your floor markings, we profile the floor prior to striping to give the paint or epoxy lines better adhesion. Warehouse striping is usually done by profiling the polished concrete surface to assure adhesion by in preparation in laying down the hard setting two part epoxy. If you simply have an old concrete floor that needs to be completely cleaned of years of grease dirt and abuse, we can clean and etch the floor in preparation for epoxy striping or urethane sealers & other coatings. Picking the right preparation method for your floor and project requires a variety of factors and cost decisions.